dinner | What's Cookin' Good Lookin'? I overdid it this Easter. Like, really overdid it. So much so that I woke up this beautiful Easter Monday feeling terribly ill and with a pain in my belly that my husband was convinced was my appendix getting ready to burst. It wasn’t. It was just my body in revolt from the shocking way I’ve “nourished” it over the past couple of days. I’d entered the long weekend knowing that my usual rules were going out the window, and had every intention of getting back to my usual routine today. It’s always destined to be a Monday, right? However, my body thought it would help me be damned sure that I did in fact get back into it, by making me sick to my stomach at the mere thought of food. After a few hours of feeling like total crap, I slowly, slowly started feeling better. By late afternoon, I was actually starting to feel hungry. I was craving vegetables and simplicity. But I also wanted a new-to-me dinner that was interesting, while not putting any stress on my somewhat ginger stomach. Nothing fatty, or rich, and in no way related to chocolate or cake. Once again, I was relieved that I have an arsenal of recipes stored in My Fitness Pal, with the calories already calculated, links to the recipe, and my own adaptations noted. It REALLY makes life easier, especially when you don’t really have a clear idea of what you want. 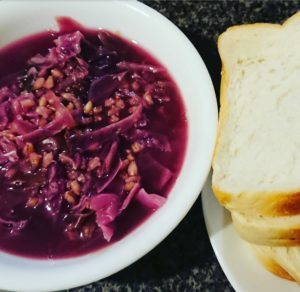 Scrolling through, I saw the link to Smitten Kitchen’s Cabbage and Farro Soup, and knew that I’d found what I’d be cooking tonight. I did make some changes – I added ginger, used red cabbage instead of green to give it a beautiful rich purple colour (Deb bemoans how beige her soup is, but using red cabbage yields quite a dramatic looking soup), swapped out the farro for the pearl barley I already had in my cupboard, and eliminated some of the oil, because you really don’t need quarter of a cup here. All in all, the results were fantastic, and I’m looking forward to leftovers tomorrow, when the barley has drunk the soup and it transforms into a whole new cabbage dish. I also used a whole – albeit tiny – cabbage, and discarded the core, as a matter of preference. That left me with more cabbage than the original recipe calls for, so I increased the ingredients by 150% , meaning it serves 6, rather than 4. Which is a blessing, because, like I said, leftovers. 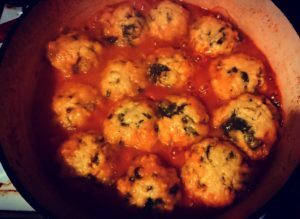 My take on the recipe yields servings of 222 calories each, and that includes the parmesan with which the soup is served. Heat oil in a large saucepan/stockpot over medium-low heat. Sweat onions for 5 minutes, until softened but not coloured. Add garlic and ginger, and stir to combine. Add the cabbage over the top of the onion mixture and Cover pot with a lid. Steam the vegetables for 5 minutes, until cabbage starts to wilt. Stir to combine. Replace lid and cook for a further 15 minutes, stirring occasionally. Cabbage will be very tender, and sweet to taste. Stir in vinegar, and season with salt and pepper. Be very generous with the pepper, as it complements the dish so well. Add barley and stir to combine. Pour in the chicken broth. Bring to a simmer, cover, and cook for up to 40 minutes, stirring occasionally. Serve in bowls. Top with parmesan cheese and another good crack of black pepper. Posted in dinner. Tagged barley, cabbage, dinner, soup. It’s finally cooling down, which means I can pull out my beloved red cast iron pot and whip out the comfort food recipes to help warm me up. Seriously, people joked that I would feel the cold after losing all the weight. They weren’t wrong. Last winter was miserable – I was ALWAYS cold and found it difficult to warm up. I’m hoping this winter, I will be more acclimated and less uncomfortable, despite being slightly smaller again. It has to be said, that during the Winter months, I sometimes miss some of the heavier stews and casseroles that are suprisingly high in calories despite feeling like a wholesome bowl of goodness. Of course, rather than throwing in the towel and giving in to temptation, I’ve turned to searching for lighter, but equally comforting – recipes to fill the void. Some of them have been sad failures – watery, lame slop with little flavour and no texture. Some – like this awesome “stoup” (soup so thick that it’s almost a stew) adapted once again from Taste – bring joy to my cold self. 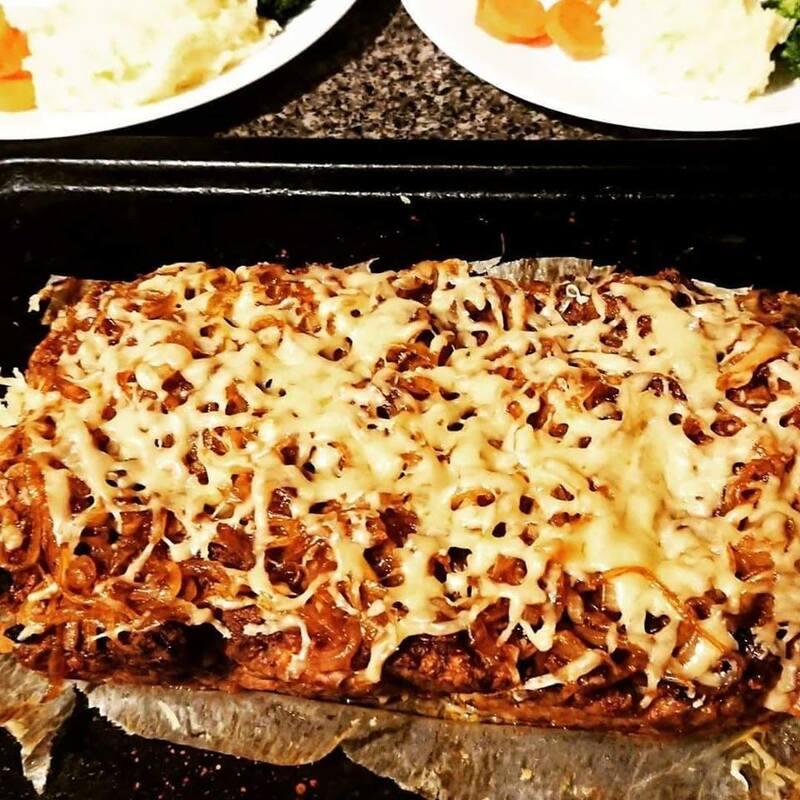 It’s only 423 calories, and fills the cravings for veggies, bread, cheese and potatoes, making it the perfect winter staple. And unlike many winter warmers, it doesn’t take hours and hours… it’s done in less than an hour. Just to add one more tick to the boxes, this soup is also vegetarian if you use the correct parmesan. 1. Combine spinach flour in a mixing bowl and make a well in the centre. In a jug, combine the rest of the dumpling ingredients and pour into the well. Mix gently until well combined. Roll into 15 balls and place on a clean, dry plate. 2. In a large saucepan, heat the oil and sweat onions over medium heat until translucent. Add nutmeg and paprika, stirring for 30 seconds until fragrant. 3. Tip in all vegetables except for the pumpkin and stir to coat with the spices. Add tomatoes and stock, using the stock to clean out the tomato tin. Cook, covered, for 10 minutes, until starting to soften. Stir every few minutes to prevent veggies from catching. Add pumpkin, and cook, covered, for a further 5 minutes, still stirring periodically. 4. Gently place the dumplings atop of the soup and lower the heat to medium-low. Cover again, and cook for 20 minutes, until the dumplings are cooked through. Serve garnished with fennel fronds. Posted in dinner. Tagged dinner, dumplings, meals, parmesan, pumpkin, soup, vegetables, vegetarian. As with most kids who like to cook, Miss 7 loves baking, and that’s where her culinary career started – helping me make cakes and muffins. It’s simple and easy, and has a fabulous reward at the end – of course kids love it! However, Miss 7 isn’t really much of a cake person (unless we’re talking chocolate cake! ), but she is an attention-loving person. She’ll shamelessly admit that she loves cooking, not for the end result, but for the credit. Chefs and their egos start young, it seems! This recipe is pretty foolproof – remove the chocolate and the bananas, and you’re left with a moist and tasty basic cupcake recipe that you can pretty much add anything too. I can’t even remember where I found that particular recipe, but for the past 15 years or so, I’ve stayed pretty loyal to the flour, butter, egg, milk and sugar ratios, because it’s never failed, and everybody seems to love it. Then, a world of toppings and additions await, and the sky’s the limit. 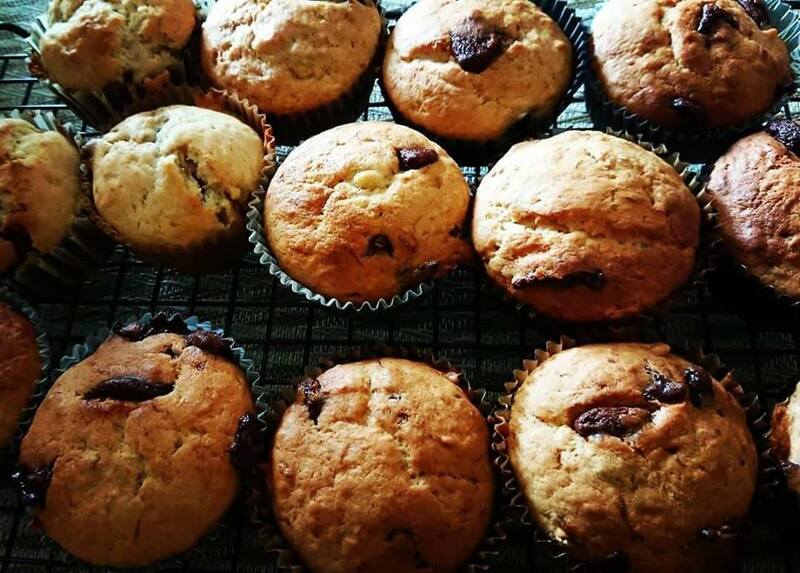 I have calculated that the base cake recipe has 200 calories, so with the addition of the banana and chocolate, each muffin is about 240. I hesitate to become too technical with these because after all these years, I barely measure anything anymore. I tend to just estimate the calories of whatever I add to the base and call it a day. I mean, I’m not eating them when I’m being particularly fastidious about my food intake, anyway. 1/2 cup chocolate buttons (we used Nestle melts), chopped coarsely. There’s no reason you can’t use choc chips, but the large, uneven chunks have a charm of their own. Preheat oven to 180C and line 2 muffin pans with 18 patty cases. Beat bananas until they form a soft mush – I use my stand mixer for this. Add butter, sugar and vanilla, and beat until well combined. The mixture will be very wet. Add eggs one at a time, beating after each addition until well combined. Sift flour into mixture and stir gently to combine. Gently fold in choc chunks. Spoon mixture into prepared pans and bake for 20 minutes, or until an insterted skewer comes out clean. Posted in dinner, snacks. Tagged amelie, banana, choc, cupcakes, muffins, snacks, treats. But you know what? It might take 15 minutes to cook, call microwavable rice, and be as far from authentic Korean as humanly possible, but nobody complained tonight about that. In fact, things almost came to blows when it came to calling dibs on leftovers for lunch tomorrow. It’s stupidly simple, but more importantly, it’s just really, really tasty. 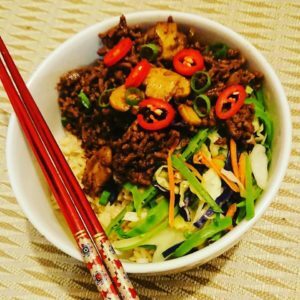 The meat is sweet and warming, the veggies are crunchy and delicious, the rice offers a carby hug that reaches your soul, and the chilli gives everything a nice kick. Of course, the chilli is entirely optional, but it gives a balance that I personally wouldn’t want to mess with. At less than 400 calories a serve, it’s a great comfort meal without going nuts. It’s full of veggies and good stuff, and you absolutely can omit the brown rice if you so desire (although, happiness for me is knowing that I don’t have to anymore!) without sacrificing the flavour. 1 spring onion (shallot), thinly sliced, to serve. Heat oil in a frypan over low-medium heat. Add onions and mushrooms and cook, stirring occasionally, for 5 minutes until softened. Add garlic, ginger and mince to pan and brown for 5 minutes, stirring often to break up meat and cook evenly. Stir in honey, soy and vinegar. Reduce heat to low, and cover. In a clean frypan, sauté cabbage, carrots and snow peas for 2 minutes, until starting to wilt but not completely soft. Meanwhile, cook rice according to packet directions (begin cooking raw rice at the very start of this recipe if not using microwave rice). Divide rice into bowls. Top with meat and vegetables, and garnish with chilli and spring onions. I’m sure I’ve waxed lyrical plenty of times about how much I love soup, but oh my God, I LOVE soup. Scrap that – I love hearty, warming, sticks-to-your-ribs soup. You’re extremely unlikely to catch me with a thin, watery cup of powdered soup anywhere near my lips, but if I could swim in a thick homemade soup, I would happily dive in. I also have this weird obsession with pearl barley. Is it weird to have a favourite grain? It’s chewy, tasty, filling, low calorie, healthy and lends a sense of nostalgia that makes absolutely no sense, seeing as though I don’t remember ever eating it as a child. I guess it’s just comforting. This miso barley soup combines three of my very favourite foods. And while it takes a while to cook, the most labour intensive part of it is chopping the vegetables. It’s a forgiving, undemanding recipe that’s perfect for those cold winter nights where you have plenty of time, but don’t want to spend it slaving over the stove. I was a little shy about this recipe, although I have no idea why. So, I made chicken to go with it. I’m usually of the opinion that soup is a meal unto itself, but there was something holding me back. Perhaps concern that my family would find it unfilling, or bland? 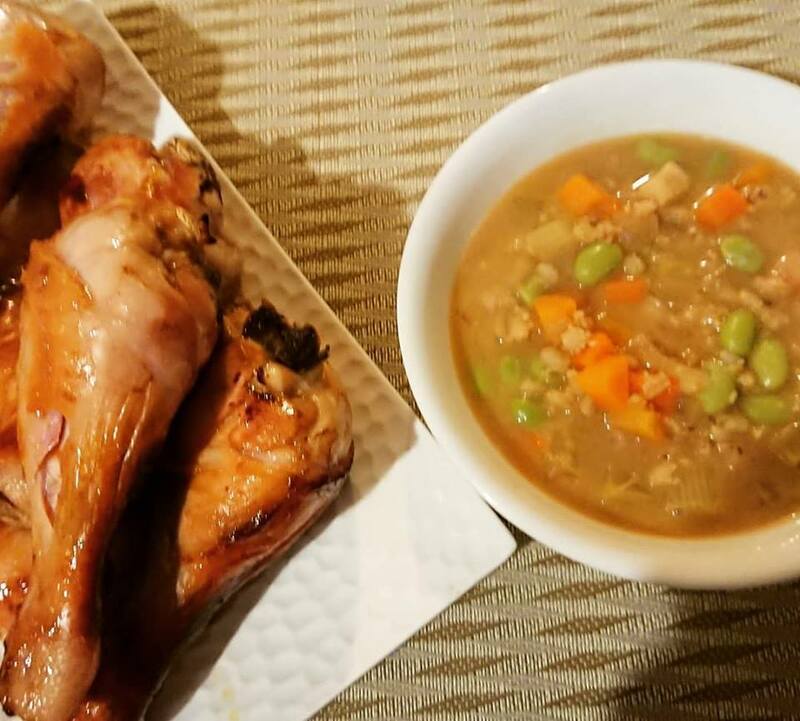 Neither was the case, however, a couple of honey soy roasted chicken drumsticks absolutely lifted this soup to a whole new level. 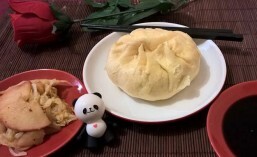 Eaten separately, or thrown into the soup – either ways works a complete treat. 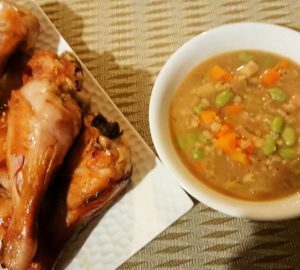 Sans chicken, the soup is a diet-friendly 246 calories, and assuming that you’re using regular chicken legs and those of not some mutant giant bird, you can allow for about 103 calories per drumstick. Heat oil in a large, heavy based saucepan (a cast iron pot is perfect!) over low heat. 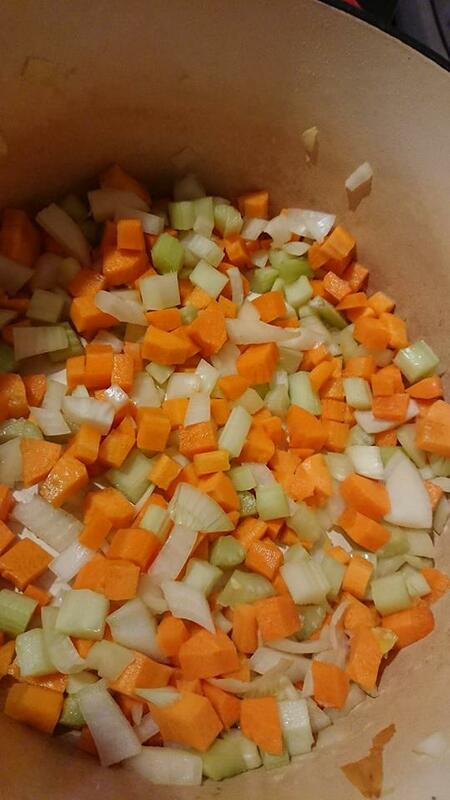 Add diced vegetables and cook, stirring occasionally, for 5 minutes until softened and onions are sweating. Add garlic and ginger, and stir for 1 minute until fragrant. Mix in barley. Add water and miso paste, and stir well to combine paste. Increase heat to high to bring to the boil. Reduce to medium low, cover and cook for 45 minutes. Stir occasionally to prevent grains from sticking to the bottom. Add edamame and soy sauce, cover, and cook for a further 8 minutes. Posted in dinner. Tagged soup. I’m sure we all have that weeknight that we dread because we’re expected to be in 4 places at once, and behave like fully functional adults in the process. For me, that’s Thursdays (I never could get the hang of Thursdays…). It’s my afternoon meeting day at work, from which I rush to get Miss 7 to her sport training, from which I rush to get the kids to any one of three relatives’ homes (yep, I’m blessed) and then rush myself to roller derby training. I leave work at 4 and get home just after 9. This recipe is made for days like these. Not only is it super quick if you can squeeze dinner into your afternoon, it is also amazing if you make it the day before, stick it in some Tupperware and offer it as a bribe for those kind enough to watch your offspring while you repeatedly push into people and fall to the ground (sometimes on purpose!) while wearing roller skates. Now, neither carby spaghetti nor oily pesto are the poster children for weightloss and healthy eating, but there is no overemphasising how little that has stopped me from cooking this dish. I’ve eaten this at least once a month for the past 10 months, and lost the equivalent of both my children. For me (and I speak for me alone, your experiences are totally valid, too! ), I refuse to cut out any one particular food group, or deprive myself, because that’s when I start to feel I’m losing control and missing out, so I concentrate on portion control and balancing it out with the rest of the day’s food choices. A serve will set you back 447 calories (with parmesan cheese, because cheese is life), but it will keep you going through a hectic training session and into the next morning. Besides, during Winter, it’s like a warm hug. Total comfort food, but very nutritious, too. Win win! Cook spaghetti in boiling water to packet instructions, until al dente. Drain pasta. Meanwhile, spray large fry pan with oil. Heat pan over medium heat, and add garlic, mushrooms and chicken. 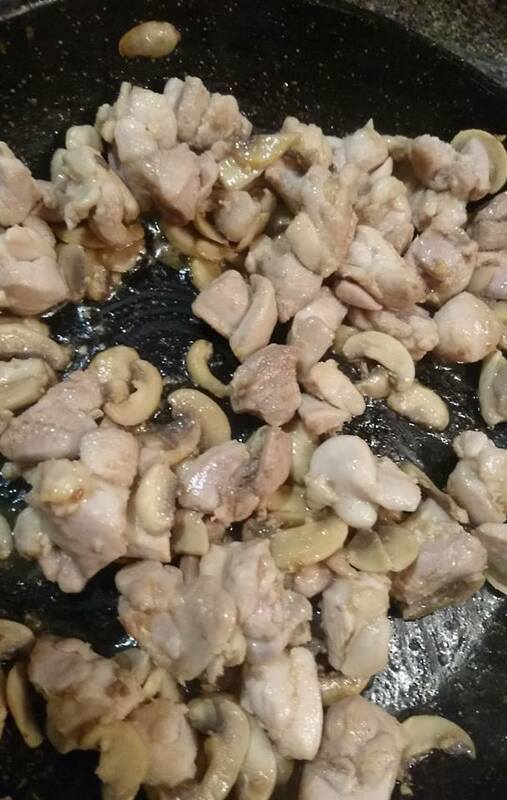 Stir, increase heat and cook for 4-5 minutes until mushrooms are golden and chicken has browned all over. 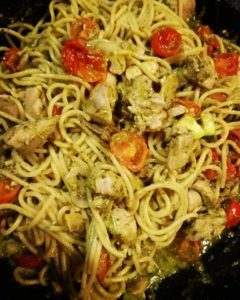 Add pesto, cover pan and adjust heat to low. Swirl a tablespoon of water in the jar to loosen any pesto, and add to pan. Cook, stirring occasionally, for 5 minutes or until chicken is mostly cooked through. Add tomatoes and zucchini pan, cover again, and cook for 3 minutes or until vegetables have softened. Add spaghetti and toss gently to combine. Serve into bowls and top with parmesan cheese and pepper. Miss 7 is a strange child, in that she – who is the least adventurous eater in our family – has a weird obsession with Brussels sprouts. Hubby and I are more than happy to cook and eat them (as long as they’re sauteed not boiled, because boiled sprouts are sad and awful), but poor Master 10 is a lot less enthusiastic about them. 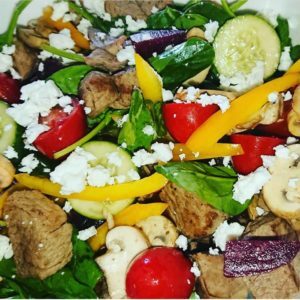 As such I went on a quest to find fun ways to serve this poor, misunderstood vegetable, and as always, Taste.com.au came to the rescue – this time, with this awesome salad. I’ve mentioned before that I don’t love when salads (or anything, really) are drowning with oil. I appreciate the health benefits of a good quality virgin olive oil, but I still don’t love the taste or texture of super oily food. And the husband doesn’t like couscous, so as always, I’ve changed things to meet my family’s needs and preferences, and urge you to do the same (so, add the extra oil if you desire). Recipes should be guidelines, not gospel. Unless we’re baking. Then, I’m too scared to stray too far! 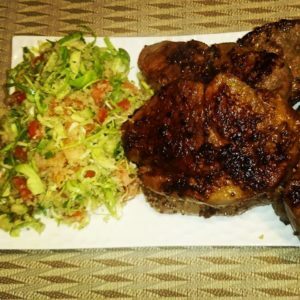 As the recipe on this blog stands, you end up with a very generous side dish for 72 calories. I like to serve it with a dice barbecued or grilled meat (such as the pictured honey mustard lamb) and some steamed potatoes for a simple dinner, but a serve of the salad mixed with a tin of tuna makes for an incredibly healthy and yummy lunch on a busy work day, too. It should keep in an air tight container until at least the next day – I’ve never had any left over past that! Place wheat in a heatproof bowl. Add boiling water and let sit for 5 minutes. Liquid will have been completely absorbed. Fluff with a fork to separate grains and allow to cool completely. Combine wheat, herbs, Brussels sprouts, tomato and cucumber in a large bowl. Combine lemon juice and oil and evenly pour over salad. Mix well and serve. I love salad. Perhaps even more than soup. Maybe. Perhaps it’s equal. Either way, it’s a lot. Salads generally gets me through the hot, disgusting Sydney summers, and then when it turns bitterly cold, I invariably feel a sense of loss. And then I realised the glory that is a warm salad! 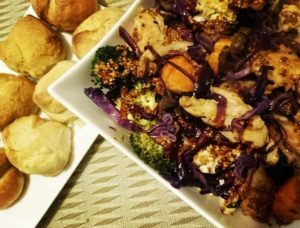 Like most of it’s ilk, this recipe is extremely versatile and forgiving – it’s really just roasted veggies and some chicken. But tossed together with the right dressing, it is so much more. It’s complex, and warming, and filling, and makes you feel a little smug because look how healthy it is! It’s barely adapted from Taste, but the addition of cauliflower was due to having less broccoli than I thought, and was a more than welcome addition to the mix. I also use a lot less oil than the original, because I don’t enjoy the taste of food that is drowning in oil – even the healthy, high quality oils. Slice chicken into tenderloin-sized strips, if using breast or thigh. Combine 1/2tbs oil, garlic and basil and rub over chicken. Cover and set for 15 minutes. Meanwhile, combine broccoli, caulifower and sweet potato with 1tbs oil. Arrange on a baking tray in a single layer, and roast for 25 minutes on the bottom level of oven. Heat frypan over medium high heat, and cook chicken for 10 minutes, turning every few minutes. Remove from pan and cover with aluminium foil to rest. In the same pan, add cabbage and mushrooms. Combine well and cook over medium heat for 4 minutes, until mushrooms have softened. In a small jug, combine remaining oil, vinegar, sugar and mustard. Combine chicken and vegetables in a salad bowl. Pour over dressing and toss to combine. Posted in dinner. Tagged dinner, salad.